One day, while visiting a friend’s house, it dawned on the young Aviya Kushner that most children do not spend dinnertime arguing with their parents in Hebrew about the idiosyncrasies of Biblical grammar or the meaning of the first three words of Genesis. She registered further shock when she realized that most families do not discuss the grammar of ancient languages at all. Kushner’s Israeli mother was a would-be Bible scholar turned yeshiva day school teacher who, after her children went to sleep each evening, studied Akkadian late into the night in order to make sense of Biblical Hebrew. Her father had fallen in love with Hebrew as an adult (he was also a mathematician, after whom a theorem was named). Modern Orthodox Jews by affiliation, Kushner’s family lived in the dense Hasidic heart of Monsey, New York, where their neighbors viewed them with a sort of benign curiosity. Although the Kushners were set apart from their neighbors in many respects, they shared a reverence for the language of the Torah. On Tuesday nights, while the Kushner family was parsing biblical grammar, the ultra-Orthodox wedding halls near their home were filled to capacity due to a peculiarity in the biblical verse that describes the third day of creation as “good” twice rather than once. In the environment in which Kushner was raised, both inside and outside the home, linguistic features of the Hebrew Bible were more than a subject of scholarly inquiry, they were the foundation of a world view and a way of life. Years later, Kushner became a journalist living in and covering Israel during the Second Intifada. Seeking an escape, she enrolled in the famous University of Iowa Writers’ Workshop, where she studied with Marilynne Robinson. Robinson is no stranger to the Bible. Her work is shot through with biblical language and themes. Her spare and direct prose evokes the cadences of the Bible itself, and her recurring character Reverend John Ames models what it means to live a life devoted to reading and reflecting upon the Bible. So when Robinson taught a Bible class for the Writers’ Workshop, Kushner was not surprisingly an eager participant. Yet, while Kushner was “stunned and moved” by the poetic beauty and majestic scope of the King James Bible, she was also disappointed. As a native Hebrew speaker, Kushner had not spent much time reading the Bible in translation, and she was shocked at how different it was, both in form and in substance, when translated into English. “Sometimes,” Kushner felt, “the choices were beautiful, sometimes slightly inaccurate, and sometimes just plain wrong.” She could not shield her dissatisfaction from Robinson, who took Kushner’s criticisms in stride. “This will be a book,” Robinson said. For example, the Bible’s frequent phrase “and God said” is actually “and said God.” Thus any Bible translation project will necessarily begin with re-ordering sentences and end up re-ordering meaning. Kushner also discusses how the gendered nature of the Hebrew language is difficult to render in gender-neutral English. In Hebrew, on the third day of creation, a feminine earth sprouts forth her grass, “va-totzeh ha-aretz desheh,” alongside with the masculine seed that yields another form of grass, “eisev mazria zera.” This delicate balance between feminine and masculine is ignored in most translations, or, in the case of the King James Bible, depicted as exclusively male. Such observations are interesting on aesthetic grounds, but they also demonstrate the way in which the specific words employed by the Bible are inextricably linked to its world view. While Kushner’s analysis is creative and intelligent, not all of her biblical interpretations would withstand the test of scholarly inquiry or even the probing gaze of her own mother. But even if her biblical readings do not always hold muster, her book is far from sloppy or imprecise. Her memories of her family and community in particular are carefully rendered and beautifully wrought. They are a powerful tribute to the ways in which observant Jews live with, and by, the words of the Bible. Reading and interpreting the Bible has always been linked with family, from the biblical rejoinder to pass down the account of the exodus from Egypt within one’s family, “and you shall tell your children,” to the Anglo-Protestant tradition of the “family Bible,” a Bible that is passed through one’s family and records births, marriages, and deaths. While her family is certainly unique, Kushner seeks to capture what it can look like for cultural literacy to be passed down from generation to generation in any family. Kushner’s own legacy includes a story about her father’s powerful first encounter with the words “lech lecha,” which Kushner translates as “go, go”; a tiny book of Psalms her maternal grandfather gave her before she left for Iowa; and biblically influenced aphorisms passed down from European relatives who perished in the Holocaust. Interwoven with these personal memories are studies of certain core themes in the Bible as they manifest themselves in linguistic quirks that are visible only in Hebrew. One chapter that has been widely excerpted and quoted involves a discussion of the biblical matriarch Sarah’s laughter upon learning that she is going to give birth to a son in her old age. Kushner is very taken with the Hebrew phrasing of “va-titzchak Sarah bikirba,” “and Sarah laughed inside her,” or “in her gut.” The 1st-century Jewish commentator Onkelos translates this into Aramaic as “and Sarah laughed in her intestines,” and this tickles Kushner as well. 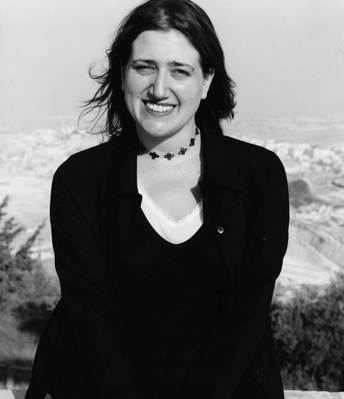 She believes that she and the rabbinic commentaries are particularly attuned to the peculiar “interiority” of Sarah’s laughter, while English translations fail to pick it up. Yet the translations cited by Kushner in this case, “Sarah laughed within her selfe” in the original King James Bible, and “Sarah laughed to herself” in the New Standard Version, are not all that bad. Even Kushner’s mother dismisses her preoccupation with the phrasing of Onkelos here and reminds her that Biblical Hebrew, by its own standards, should not always be read absolutely literally. This does not detract from the charm of the chapter, which is also about the tension between silence and speech, and how didactic readings of the Bible in translation sometimes obscure the literary pleasures it contains. Hebrew becomes abstract and “spiritualized.” What Kushner wants to give her readers is “a glimpse of the deep water of ancient Hebrew.” In this sense, she shares an affinity with recent Jewish Bible translators such as Robert Alter (and, far more radically, Everett Fox) who have been willing to make sacrifices in English to convey a sense of the original Hebrew. In school, as a child, I read the Torah from books called mikraot gedolot—“great scriptures,” also called the Rabbinic Bible in English—volumes in which each page is crammed with commentary surrounding the text of the Bible in different languages, scripts, and fonts. To the side sat the words of Onkelos, a Roman convert to Judaism, whose great first-century translation into Aramaic can be read as a commentary. Beneath the text of the Bible lay Rashi’s commentary . . . Around Rashi lay other commentators, rabbis chiming in from their perches in Spain, France, Germany, the Arab world, and Israel, spanning at least twelve centuries . . . The Hebrew text I grew up with is beautifully unruly, often ambiguous, multiple in meaning, and hard to pin down; many of the English translations are, above all, certain. 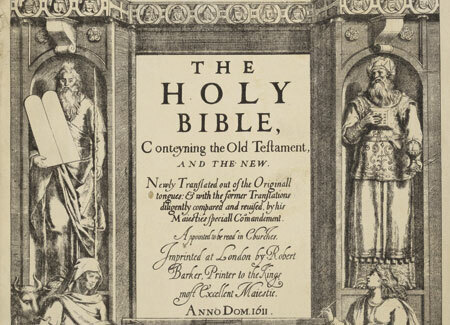 A portion of the frontispiece to the first edition of the King James Bible by Cornelius Boel, 1611. Moses and Aaron flank the central text. Just as this sort of Bible study is hampered in translation, it would also be out of place in an academic Bible department, even a Hebrew-literate one. But Kushner, with her loose, expansive readings, believes that the rabbinic commentators are actually allies of anyone who cares about the textual features of the Bible, a group that could presumably include all academics. 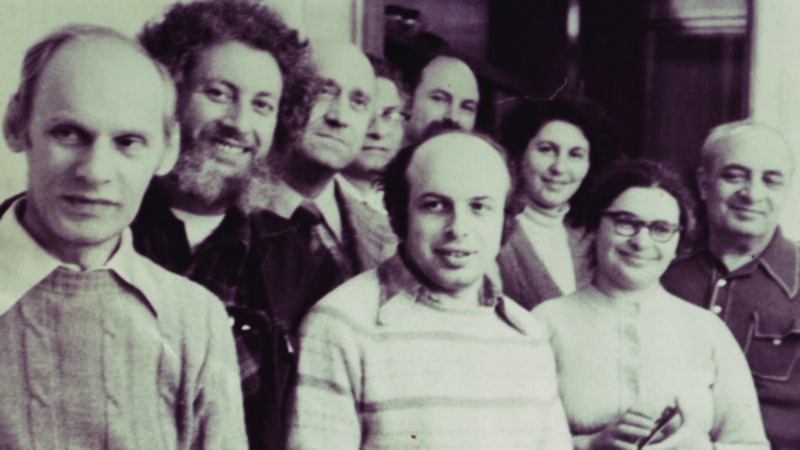 In this regard, her intellectual forbearer is Nechama Leibowitz, the legendary 20th-century Israeli Bible teacher whose weekly Torah portion worksheets were disseminated to thousands of students worldwide. 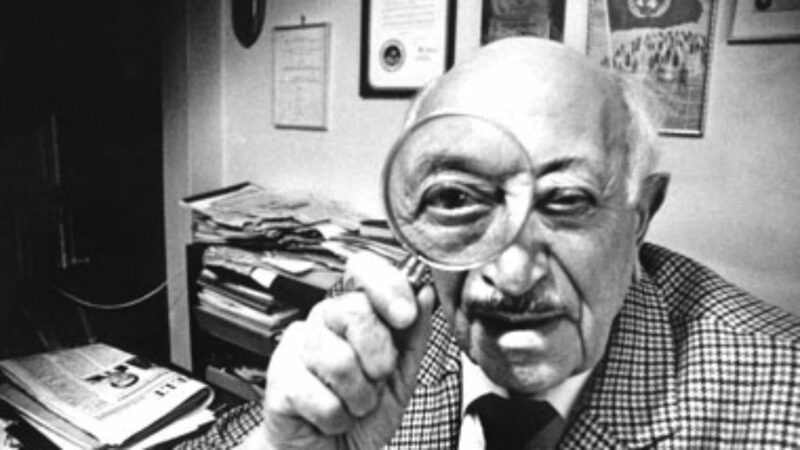 For Leibowitz, Jewish Bible commentary emerged organically from careful listening to the original Hebrew. In fact, Leibowitz is one of the few secondary sources quoted in Kushner’s refreshingly short—if, perhaps, a bit too short—source index at the back of her book. The Grammar of God is at heart more an artistically crafted ode to Bible reading than it is a work of scholarship. It is a little surprising, but in the end not terribly damaging, that she does not cite any of the many excellent books that have been written about the history or influence of the King James Bible. Along these lines, when Kushner describes her family, as well as the surrounding community in Monsey, her portraits are nuanced without being particularly critical. She depicts her aloof Hasidic neighbors with tenderness and sympathy, while admiring the way in which they live their lives according to biblical rhythms as interpreted by the Jewish tradition. In this regard she may have taken notes from Robinson, whose literary style and religious outlook are informed by what she has called an “ethics of non-judgmental, non-exclusive generosity.” This generosity of spirit characterizes the memoir-like passages of The Grammar of God as well. Several popular memoirs have been published about traumatic upbringings in ultra-Orthodox Jewish enclaves in recent years. Kushner takes another path—she explores the sweetness that she finds at the intersection of family, community, and sacred text. This generosity extends not only to her family and their surrounding community, but to the Bible as well. The Grammar of God eschews any mention of academic Bible criticism, problematic sections of the Bible that seem to throw its unity, morality, or divinity into question. Given the fact that Kushner is interested in the disconnect between the way she was trained to read the Bible as an Orthodox Jew and how it is read in the broader world, this is a little surprising, even disappointing. Then again, her celebration of the Bible does not emerge from an apologetic glossing over of its inadequacies, but rather from an intimate knowledge and understanding of the text as a world unto itself. Kushner makes a compelling case for the untranslatable nature of the Hebrew Bible, and she also shows some of the ways in which family and community are crucial in allowing it to become an integral part of one’s life. But does an audience interested in considering these points still exist? Very few people nowadays read the Bible with the persistence and devotion of Marilynne Robinson’s Reverend John Ames. It is, of course, important to distinguish Jewish ways of reading the Hebrew Bible from Christian readings of translations. However, in a cultural climate marked by the decline of Bible reading as a whole, these two sets of readers may find themselves to be very much aligned, even if the texts they are reading are radically different. Indeed, this may be what brought Kushner and Robinson together in the first place. Their readings of the Bible are different, but they do continue to read it, frequently, intently, and with generosity. When I point out to Christians that the bible they read is not quite like the bible I read in Hebrew in the 1950s they tend to be uncomprehending. How is it possible that god would permit the bible to be less than perfectly translated they ask. Of course most American Christians are monolingual and do not understand translation as anything other than a word for word exchange.